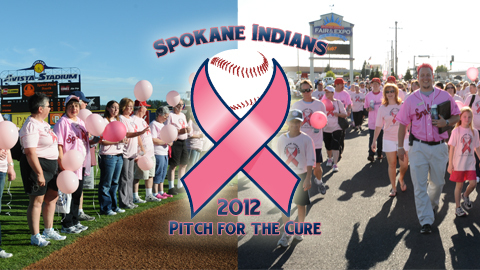 Spokane, WA - The Spokane Indians announced today that their annual Pitch for the Cure Breast Cancer Walk presented by Mike's Hard Pink Lemonade will return for 2012 on Saturday, August 25th at Avista Stadium. This marks the seventh consecutive year that the Indians and the Susan G. Komen for the Cure Foundation have collaborated on the event, with proceeds benefiting the Eastern Washington Chapter of the Komen Foundation. "The Eastern Washington Affiliate of Susan G. Komen for the Cure is excited about the Pitch for the Cure," said Executive Director Claudia Bell. "We appreciate the on-going support of the Spokane Indians, who over the last seven years have raised nearly $20,000 for our mission to save lives and end breast cancer forever." In addition to Mike's Hard Pink Lemonade, supporting sponsors for this year's Pitch for the Cure include Itron, Pepsi, and Ross Printing. Media sponsors include The Big 99.9 Coyote Country and KXLY 920 AM.